Falvey Memorial Library :: Time for SUPERBOWLES! An air of excitement has filled the city since last Sunday when the Philadelphia Eagles defeated the Minnesota Vikings, winning the NFC Championship, and punching their ticket to Super Bowl LII. In the midst of the celebration, don’t forget about your All-Star Team here at Falvey Memorial Library. Our subject librarians bring their A-games every day, providing research consultation for students and assisting in the development of the Library’s collection for current and future Wildcats! 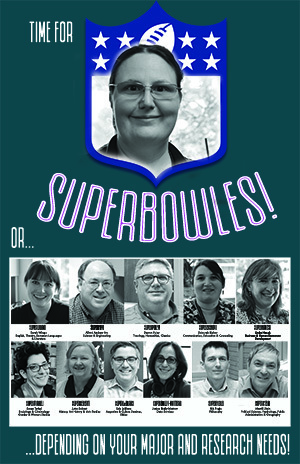 To commemorate the Eagles’ historic season and our SUPER lineup of outstanding subject librarians, Falvey will be giving away a “SUPERBOWLES” basket filled with delicious treats perfect for GAME DAY! Winning “SUPERBOWLES” snacks is easy, just fill out an entry with: your name, major, e-mail address, and name of your subject librarian.